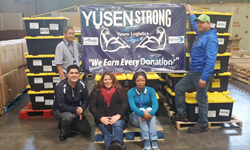 Employees of Yusen Logistics helped send supplies to victims of Hurricane Matthew. The American Logistics Aid Network (ALAN) is coordinating the delivery of emergency supplies to people affected by Hurricane Matthew. Among the companies that provided assistance were Miami-based Performance Team, which donated warehouse space for storing and organizing donated supplies, as well as UPS Inc. and Saddle Creek Logistics Services, which provided transportation and logistics services. Yusen Logistics (Americas) Inc. supported Boeing Co.'s work in coordinating shipments of relief supplies from Seattle to Charleston, S.C., to aid in the recovery from Hurricane Matthew. Yusen provided delivery to Sea-Tac Airport after coordinating warehouse services at its Seattle branch, which included receiving, sorting, labeling, and repacking supplies such as bottled water, diapers, blankets, and sanitizing wipes. Raymond Handling Concepts auctioned off this lift truck to support the fight against breast cancer. Material handling equipment supplier Raymond Handling Concepts Corp. (RHCC) held its third annual "Pink Pallet Jack Project" online auction in support of Breast Cancer Awareness Month. 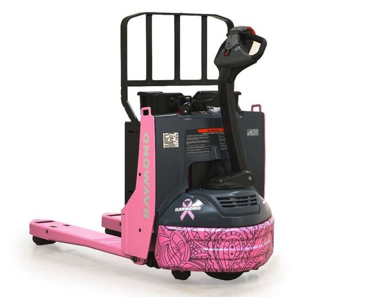 All proceeds generated by the sale of the 8210 Electric Pallet Truck will benefit the Tina Fund in Greene, N.Y., and the Hers Breast Cancer Foundation in Fremont, Calif. Third-party logistics service provider (3PL) Bonded Logistics packed a company-record 6,000 shoeboxes during its annual Operation Christmas Child outreach event, thanks to the more than 100 employees and family members who volunteered for the Samaritan's Purse project (top photo). The shoeboxes, which are filled with toys and school supplies, will be delivered to needy children affected by war, poverty, natural disaster, famine, and disease. 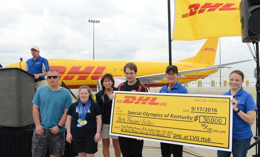 DHL employees raised $68,000 for Special Olympics Kentucky. 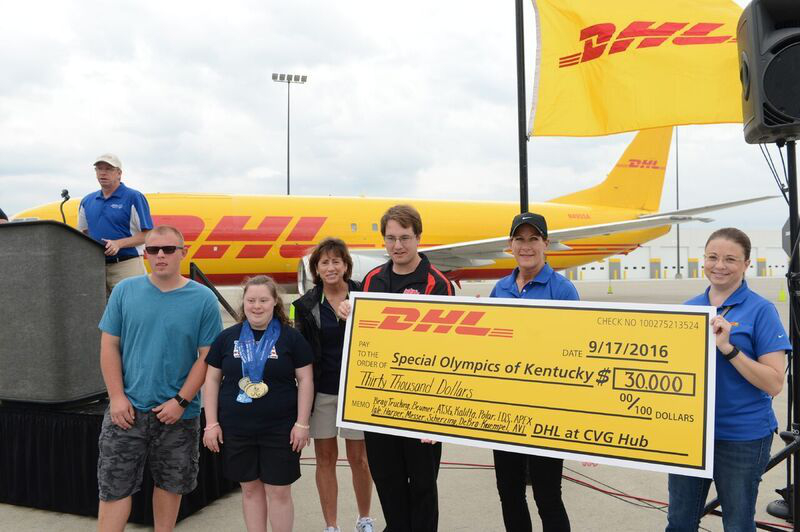 DHL teamed up with the Special Olympics and the Cincinnati-Northern Kentucky Airport (CVG) in September for the 4th annual DHL Plane Pull event, raising $68,000 for Special Olympics Kentucky and its programs for local athletes. More than 22 local businesses and civic groups competed in a race to pull one of the 140,000-pound DHL Boeing 757s across the tarmac. FedEx Corp. ran two charter flights to Haiti to deliver more than 30 tons of critical aid for survivors of Hurricane Matthew. The shipments, which included medical equipment and disaster relief supplies, were made in coordination with Direct Relief, International Medical Corps, and Heart to Heart International.